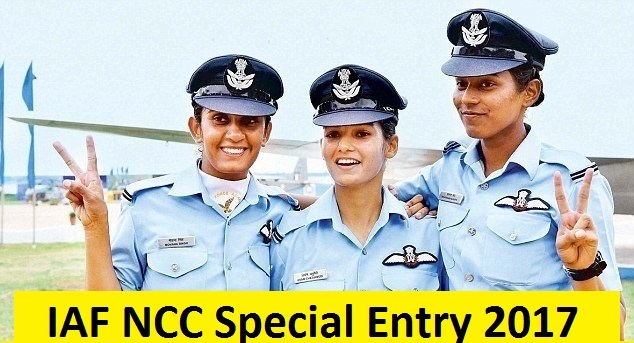 Hello Aspirants, IAF NCC 2017 - 2018 Entry we have good news for you as recently Indian Air Force also started taking NCC candidates both MALE and FEMALE for Flying branch through NCC Entry Scheme which is a direct entry for the candidates having NCC certificates only candidates should have 60% above in the graduation level exams. For more detailed about the entry read out the complete article below to know more about this. Indian Air Force Recruitment NCC 2017 - 2018 Entry. Eligible and Interested candidates can apply on or before 31st AUGUST 2017. Feel free to ask questions below in comments. (a) PC for Men - Candidates joining as PC officers would continue to serve till the age of superannuation. (b) SSC for Men & Women - The Engagement period for SSC Flying Branch is Fourteen years from the date of Commissioning (Not extendable). 1. Eligible and Interested candidates can apply on plain paper as per the format available at official website of Indian Air Force Careers Portal. Last Date to Apply is 31st AUG June 2017. ONLINE APPLICATION WILL OPEN ON MAY AT 5th AUGUST 2017 1000 HRS AND WILL BE CLOSED ON 31sh AUGUST 2017. 3. Candidates not in receipt of call letter from any of the Selection Centres for AFSB interview should presume that either their applications have been received after due date or have been found ineligible or rejected during shortlisting. No correspondence in this regard will be entertained. 4. Candidates after shortlisting will be called for AFSSB interview by Directorate General of Recruiting. 7. Candidates recommended by AFSBs will be required to go through Medical Exam. 8. Candidates who are found medically fit will be placed in order of merit as per the marks obtained in AFSB interview amongst the recommended candidates. Boarding and lodging during interviews at AFSBs are free. 8. Recommendation by AFSB confers no right of admission to the IAF, Hyderabad. 11. The merit list of the recommended candidates will be displayed official website of Indian Air Force. This was all about Indian Air Force NCC Special Entry 2017 - 2018 Flying Branch . Eligible and Interested Candidates can apply online for the IAF NCC entry 2017 from the Indian army official website. Candidates can also subscribe us to get all latest updates direct to email I'd or can follow us on Facebook for latest notifications. Feel free to ask below in comments regarding Indian Air Force NCC Special Entry 2017 - 2018 Flying Branch.